I'm looking for information on Motere Station. It was a sheep station that my Dad worked on back in 1939. I have a couple of pictures of what I believe is the area and would love to locate it. I'm coming out from the US in a couple of weeks time and hope to track a few other places he visited. I'm told there's a good chance Motere was a large station that may have since been broken up into smaller farms. let me know if this is a good way to send you the pictures and see if you recognize anything, or can maybe post it to your sight. I have no idea where Motere Station was, but I will endeavour to find out. Do you know where about's in Hawkes Bay it was... which town it was closest to, or river etc...? I know there's a township and river called Motere down in the South Island of NZ(near Nelson) but that's probably got nothing to do with your station as a lot of names are used and reused in other parts too. Another idea I have is to ask a retired stock and station agent I know - as he would know a lot of the local stations around here... past and present. And of course there's the Museum... I'll forward your email to Rosheen at our museum and see if she has any clues. Thanks for the quick response! Its late here so just time for one picture. this one is from my Dad's photo album that he had marked "Netherton Station, Otane. P.S My Mums family are Goslings! I may have to explain. My family is from England, I went traveling when I was 19 and ended up in the US. So all my family is from England. I'm Jan's husband and I saw your e-mail. Motere Station is east of Waipawa and Waipukurau( approx. 30 min drive). I am familiar with the area as I used to teach at a little school just down the road, and I have some contact with the owners son albeit fairly vaguely. However quite happy to contact them and get more details. I will contact another local family and ask about how long the current owners have been there. Email you again soon. bull stud now than a sheep station. Hope this helps and if I learn any more will forward the information. If you have dates I might be able to let them know or you might be able to contact directly. I tried a google search on Motere Station and the CHB District Council has a small amount of historical information about the sale of the Motere Block in 1908. I had heard a rumour that suggested the purchase was somewhat different but I'm not going to spread a rumour that may be unfounded. But it was a good story. Sorry, 3rd and final email tonight (I don't often email one person three times in one night). I contacted Jim who couldn't remember your father but said you were most welcome to visit. Apparently, he is going to be in America from March 28- April 4. But I know he has a son who could show you around. Please definitely don't be sorry! This information is great. I'll certainly try to contact Jim when I arrive in New Zealand. I get there at the beginning of April but I'm there for 3 months. My Dad had a school friend in England who was from New Zealand. When they finished school in 1939 his friend was going back to New Zealand and invited my Dad out too. So my Dad arrived in about August 1939. His school friends name was Dennis Harrold and there are some photos of him and his family in the link to the album, but I'm not sure where in New Zealand he was from. Looking at the pictures of the family and family dog it looks more like a suburban setting than rural. 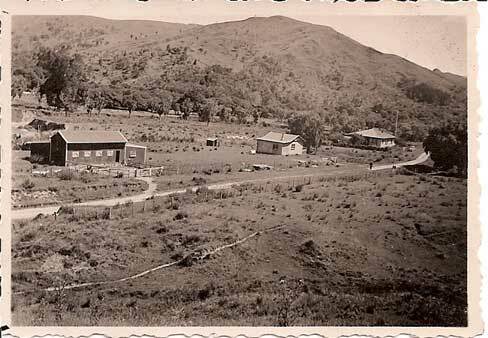 The other shots are of Netherton and Otane area I believe. There is also photos of Dad when he joined the RNZAF at 18! and became a pilot. He staid in the RNZAF all during the war and ended up in bombers back in Europe. After he De mobbed he married an English woman and moved back out to New Zealand where my half brother was born. That brother now lives here in Atlanta, but we didnt really know each other growing up. Dads first marriage didn't go too well and his wife wanted to come back to England. My Dad constantly talked of New Zealand and I think given the chance he'd have been off back there at the drop of a hat. He'd be so excited now that I was heading out there. I can't wait to see some of these places he was at and an opportunity to actually see the farm he was on would be amazing. Ok So I'm sending this link to a photo album, there's too many to pick through and try to email and I'm worried Id bog your machine down with you trying to download them. I'd love for you to put them in your website if you feel they are appropriate, if the quality isn't good enough from the web site, let me know which ones you want and I can email a higher resolution one to you. I leave in just 5 days, so its a little crazy right now. I actually have an around the world ticket, so I'm not coming back to the US and have been selling everything, so I'm in the last panic stages of getting everything done in time to leave. thanks again for all your info and help. Roger Brancher...Did you catch the part about my mothers family being Goslings! Well it is a small world and the innternet makes it even smaller. It's interesting that your a Gosling descendant too. - Its not a very common name here in New Zealand so you'd expect us to all know each other and be somehow related. Unfortunately I'm just married to one (that's Murray who emailed you last night) and so I'm only a Gosling by marriage. And Murray is not strong on his Gosling family history - (unlike me and my family roots) - which is a little unfortunate as I often have people saying - "oh, are you related to (someone) Gosling from (somewhere in NZ)?" and I have to answer that I don't know - because Murray knows his five brothers and one sister , his mother and father, and virtually no one else in his extended family. There was a bit of a rift with grandparents.which I think is very sad as I enjoy having a large extended family to call my own(and Murray enjoys my extended family too). So I suppose that makes us "cuzie-bro's" - that's NZ slang for sort of cousins. So while you're over here you'll have to drop in and see us.. although we're heading off to China from the middle of April till 7th May so we'll have to sort out when you and we will be at the same place at the same time. I haven't heard of "Netherton Station' either - but I do work out at Otane so might be able to track down someone who does. Otane is sort of north East of Waipawa, while Motere is South East so they're nearly in the opposite diection. Thanks for that link for your photos. Some of your Dad's old photos are really interesting ones - with old scenes of farming in NZ with the big Clydesdale horses, sheep dogs and the pretty nifty-looking cars. Some of them do look like the hills around where the little two teacher school where Murray used to be the principal. I looked at some of your other photos too and can you tell me whether that's you riding the mountain bike on that ravine???? I absolutely hate heights so I would never do that in a million years! I even find it hard to get up past the fourth step on a ladder - but I do try and conquer my fear from time to time to paint a mural or something.